Description: It's a beautiful day! Crystal and Olivia want to relax. 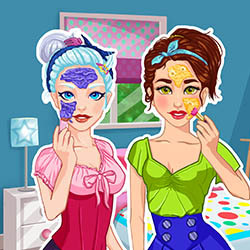 Help the two BFFs in their real makeover. First you'll have to apply some healthy treatments to clean and clear their skin face. After that, play with the combination of clothes to find the right outfit for a pleasant walk in the park. Don't forget to add the proper make-up so the girls can look amazing.